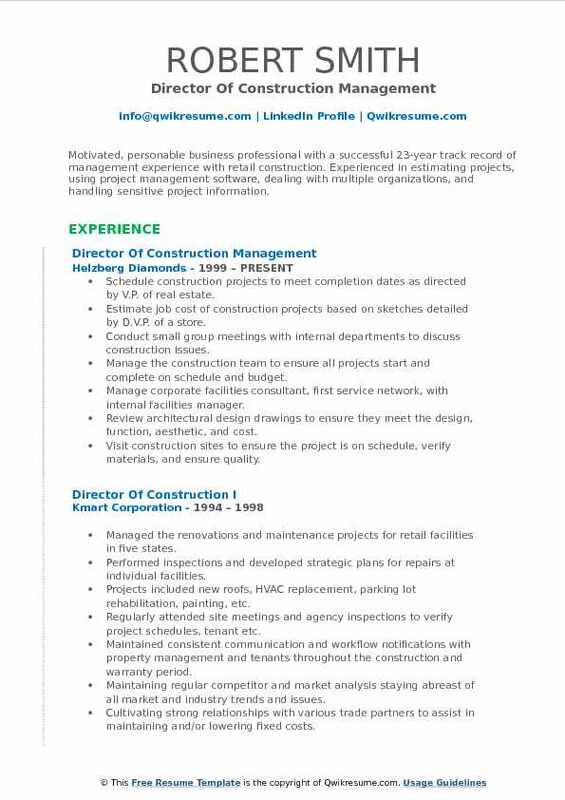 The Director of Construction is accountable for coordinating and managing various construction projects for the company. 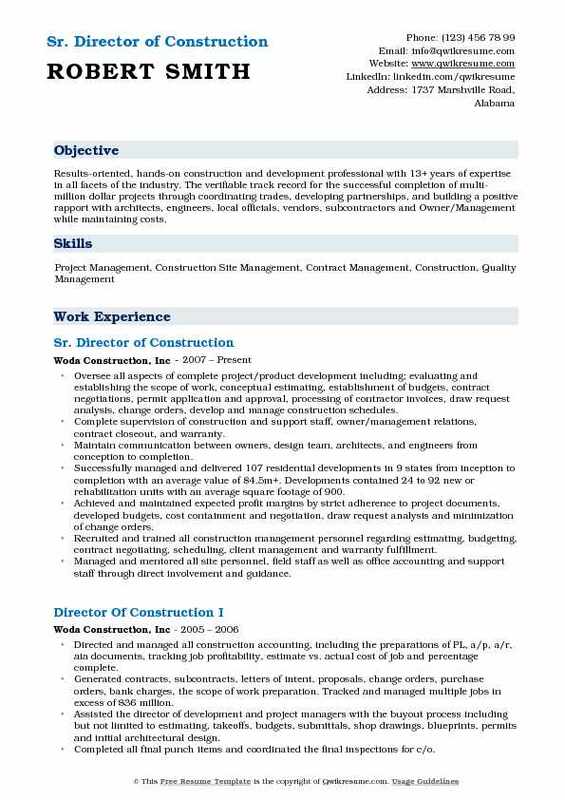 A well-drafted Director of Construction Resume mentions tasks such as – coordinating work from concept to finish, reviewing construction projects, supervising workers, delegating tasks, liaising with clients, negotiation contracts, solving issues, monitoring project to ensure building and safety regulations, selecting appropriate tools and materials, tracking inventory, analyzing and mitigating risks, ensuring quality standards, meeting contractual conditions and reviewing the project before its delivery. 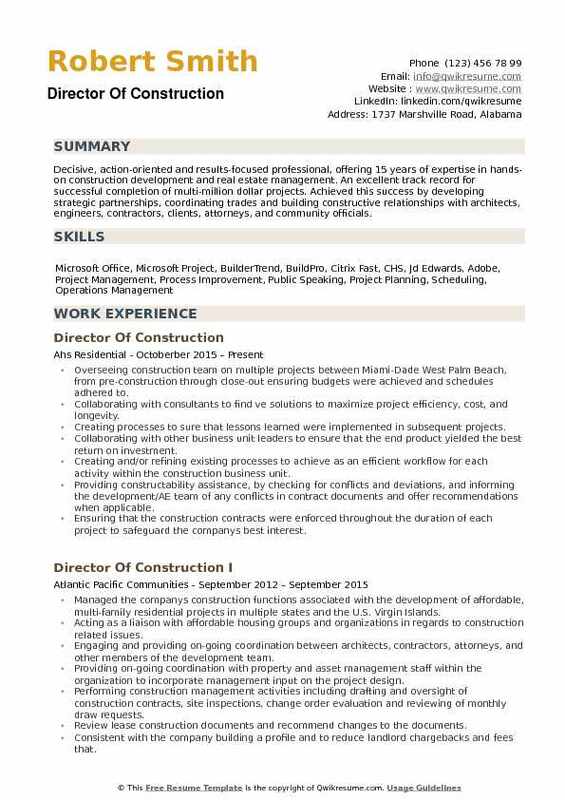 The minimum requirements needed for this role include – a deep knowledge of all facets of construction management, expert knowledge of Construction rules and regulations, familiarity with relevant software; the ability to plan and view a bigger picture, crisis management, competent in conflict and project management skills. 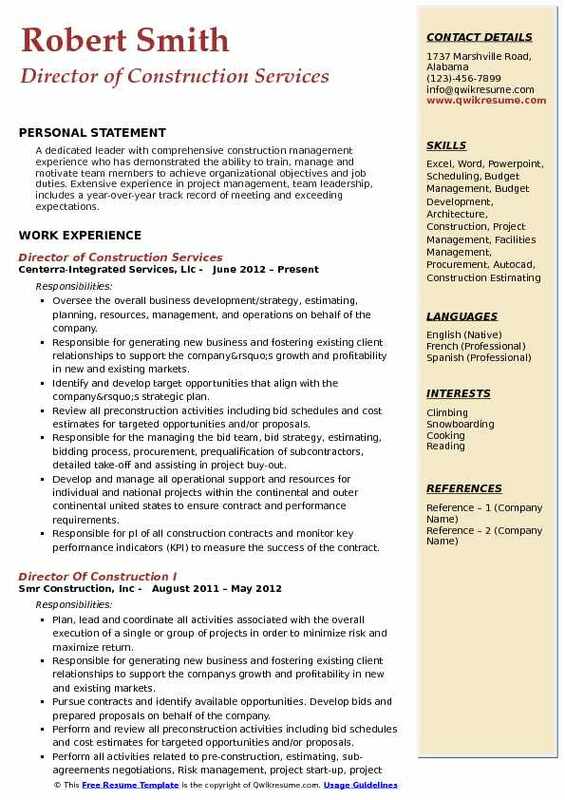 A degree in construction management, civil engineering, architecture or the related is commonly depicted in the eligible resumes. 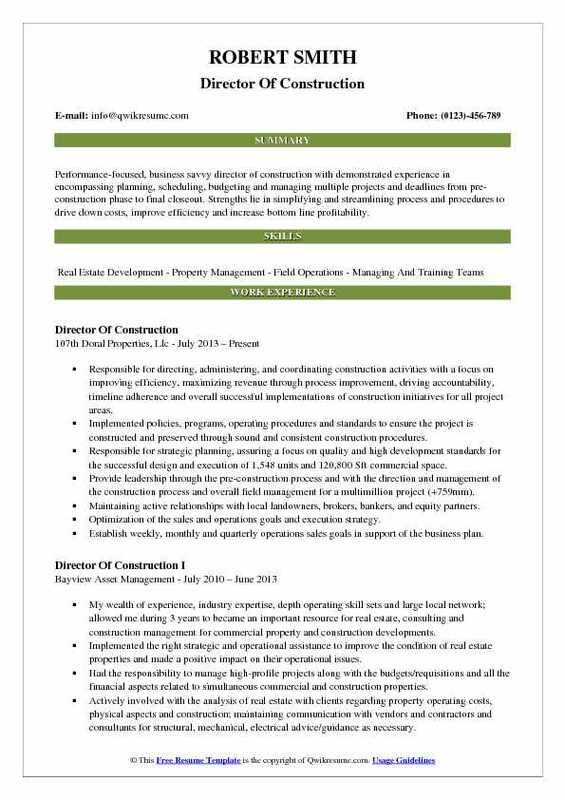 Headline : A results-driven construction management professional with over ten years of successful Project Management and Program Development experience in Commercial and Multi-family Real-Estate Development. My specialty lies in repositioning subsidized and market rate multi-family assets through efficient, practical management of various renovation and capital expenditure projects on both local and national levels. Developed and implemented improved procedures and systems for the preparation of initial site inspection reports and detailed scope of work development. Improved processes resulted in reducing the timeframe for the delivery of scopes of work, contractor estimates, drawings, and agency documents from 180 days to 90 days. Improved processes and procedures during the construction phase in order to minimize the project duration and the overall impact on the tenants during the in-place rehab. Procedures included systematic scheduling, timely tenant notification of scheduled activities, trade coordination, lead-time management, material staging, site utilization plans, quality control. Successfully managed and completed the rehabilitation of 300+ residential units, with tenants in-place, spanning nine separate properties across the State of Alabama in a sixteen (16) week timeframe. Additionally, managed the successful pre-construction and construction efforts of approximately 5,000 residential units located in 85-100 separate communities in seven states. Led and managed an internal team of four to work harmoniously with members of the finance and development departments to ensure due diligence efforts such as obtaining permits, zoning approvals, capital expenditure reports, past c of OS, and environment. Maintained communication with associated state agencies and third-party consultants through the pre-construction phases in an effort to ensure compliance with all regulations and program requirements. Developed and implemented cost coding systems for tracking construction cost in order to identify specific areas of cost overruns and for use in creating a historical cost database. Managed cost control for all active projects by verifying the accuracy of all submitted ones. Summary : A detailed, results orientated executive with extensive experience in the management of fast-paced development plans. Demonstrated abilities to coordinate multi-faceted development projects through multifunctional teams over a large geographical area, consistently meeting project deadlines and budget objectives. 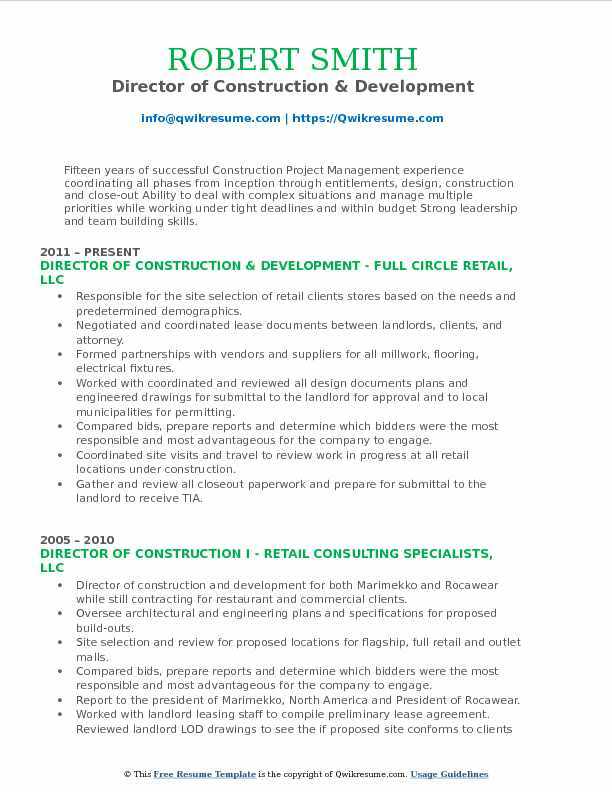 Responsible for a new store development and re-model plans for the company-owned concepts, in freestanding, end caps, non-traditional airport, university and theme park locations in the midwest, southeast, and northeast. Total new openings of 25-30 new locations per year and 10 remodel per year. Developed construction program for alternative brand franchised concepts of 4 tide dry cleaners and 2 Yogurtland. Worked with multiple regional designs, real estate and operational teams on the development of market plans and strategies, reviewed site selection, and approved development costs. Directed, coached and mentored a team of up to five remote project managers, energy manager, and one project manager assistant. Interacted with design teams to develop building and equipment specifications, along with prototypical elements. Assisted in the drafting of letters of intents, landlord work letters, and performed lease reviews for new and renewal projects. Generated, reviewed and approved development cost budget, as well as tracking current and historical costs. Guided team to a high accuracy percentage of initial estimated development cost to actual final development cost. Average year development value of 25 million dollars per year. Controlled both departmental and regional capital budgets with consistent under budget results. Summary : Performance-focused, business savvy director of construction with demonstrated experience in encompassing planning, scheduling, budgeting and managing multiple projects and deadlines from pre-construction phase to final closeout. Strengths lie in simplifying and streamlining process and procedures to drive down costs, improve efficiency and increase bottom line profitability. Responsible for directing, administering, and coordinating construction activities with a focus on improving efficiency, maximizing revenue through process improvement, driving accountability, timeline adherence and overall successful implementations of construction initiatives for all project areas. Implemented policies, programs, operating procedures and standards to ensure the project is constructed and preserved through sound and consistent construction procedures. Responsible for strategic planning, assuring a focus on quality and high development standards for the successful design and execution of 1,548 units and 120,800 Sft commercial space. Provide leadership through the pre-construction process and with the direction and management of the construction process and overall field management for a multimillion project (+759mm). Maintaining active relationships with local landowners, brokers, bankers, and equity partners. Optimization of the sales and operations goals and execution strategy. Establish weekly, monthly and quarterly operations sales goals in support of the business plan. Provide accurate and regular updates to senior leadership on all goals in terms of the achievement/progress. Strategic involvement in setting pricing, product mix, market analysis, new community openings, and community involvement. 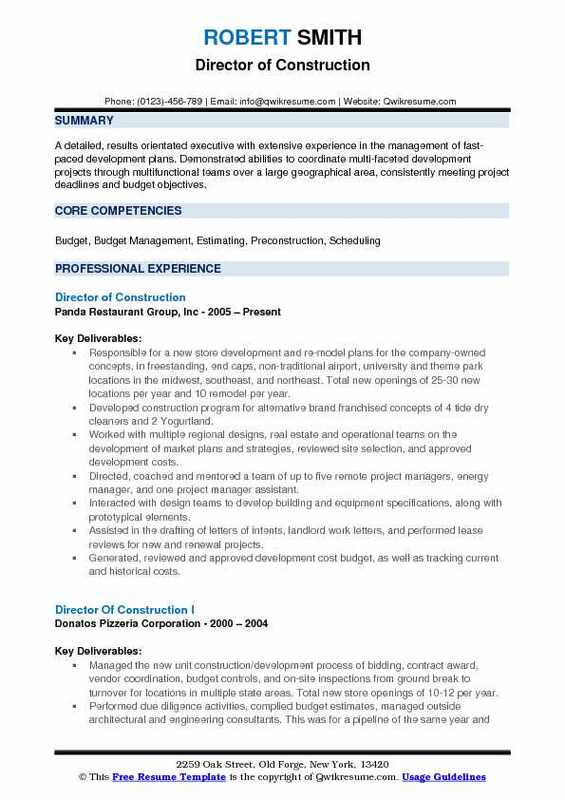 Summary : Motivated, personable business professional with a successful 23-year track record of management experience with retail construction. Experienced in estimating projects, using project management software, dealing with multiple organizations, and handling sensitive project information. Schedule construction projects to meet completion dates as directed by V.P. of real estate. Estimate job cost of construction projects based on sketches detailed by D.V.P. of a store. Conduct small group meetings with internal departments to discuss construction issues. Manage the construction team to ensure all projects start and complete on schedule and budget. Manage corporate facilities consultant, first service network, with internal facilities manager. Review architectural design drawings to ensure they meet the design, function, aesthetic, and cost. Visit construction sites to ensure the project is on schedule, verify materials, and ensure quality. Evaluate and purchase items such as wallpaper, carpet, furniture, etc. To ensure durability, functionality, cost, quality and deliverability schedule of these items. Headline : I am a dedicated, experienced leader in the construction industry. My experience as a contractor and architectural designer has helped me acquire a sophisticated understanding of the building process. I emphasize running a tight schedule, innovating construction methods, developing strong relationships, and building high-quality projects. Skills : Estimating And Buy Outs, Budget Analysis, Scope Review, Construction Planning And Scheduling, Change Orders And Negotiations, Team Building And Leadership, Risk Management, Quality Control, Safety And Compliance, Payment Applications And Close Out. Oversaw all aspects of construction and warranty, including product development, production, construction, and customer relations. Worked in conjunction with the VP of purchasing to reduce variance spend as well as accurate budget costs. Participated in development of 80+ regionalized plans and the implementation of the new plans. Directed team of 50+ that included area construction managers, builders, QC manager, warranty manager, and others. Built and directed accountable, results-driven teams through clear direction and detailed expectations. Managed all construction related activities in 39 outlets and 780 closings. Worked in conjunction with purchasing to secure trades, pricing, and quality. Developed long-term plans for the organization around the growth and development of construction. Improved processes of the construction department, including, but not limited to operational systems, job- costing, project management skills training and development, customer service initiatives, safety. Lead 100% buildpro compliance within the division to include all team members and vendors. Summary : Results-oriented, hands-on construction and development professional with 13+ years of expertise in all facets of the industry. The verifiable track record for the successful completion of multi-million dollar projects through coordinating trades, developing partnerships, and building a positive rapport with architects, engineers, local officials, vendors, subcontractors and Owner/Management while maintaining costs. Oversee all aspects of complete project/product development including; evaluating and establishing the scope of work, conceptual estimating, establishment of budgets, contract negotiations, permit application and approval, processing of contractor invoices, draw request analysis, change orders, develop and manage construction schedules. Complete supervision of construction and support staff, owner/management relations, contract closeout, and warranty. Maintain communication between owners, design team, architects, and engineers from conception to completion. Successfully managed and delivered 107 residential developments in 9 states from inception to completion with an average value of $4.5m+. Developments contained 24 to 92 new or rehabilitation units with an average square footage of 900. Achieved and maintained expected profit margins by strict adherence to project documents, developed budgets, cost containment and negotiation, draw request analysis and minimization of change orders. Recruited and trained all construction management personnel regarding estimating, budgeting, contract negotiating, scheduling, client management and warranty fulfillment. Managed and mentored all site personnel, field staff as well as office accounting and support staff through direct involvement and guidance. Direct involvement with the development/management team to ensure marketability of all products was maintained at a superior level. Summary : Fifteen years of successful Construction Project Management experience coordinating all phases from inception through entitlements, design, construction and close-out Ability to deal with complex situations and manage multiple priorities while working under tight deadlines and within budget Strong leadership and team building skills. Responsible for the site selection of retail clients stores based on the needs and predetermined demographics. Negotiated and coordinated lease documents between landlords, clients, and attorney. Formed partnerships with vendors and suppliers for all millwork, flooring, electrical fixtures. Worked with coordinated and reviewed all design documents plans and engineered drawings for submittal to the landlord for approval and to local municipalities for permitting. Compared bids, prepare reports and determine which bidders were the most responsible and most advantageous for the company to engage. Coordinated site visits and travel to review work in progress at all retail locations under construction. Gather and review all closeout paperwork and prepare for submittal to the landlord to receive TIA. Review and answer all maintenance and construction-related issues after the opening of stores. Complete close out financial reports to show adherence to initial budgets and determine any overage. 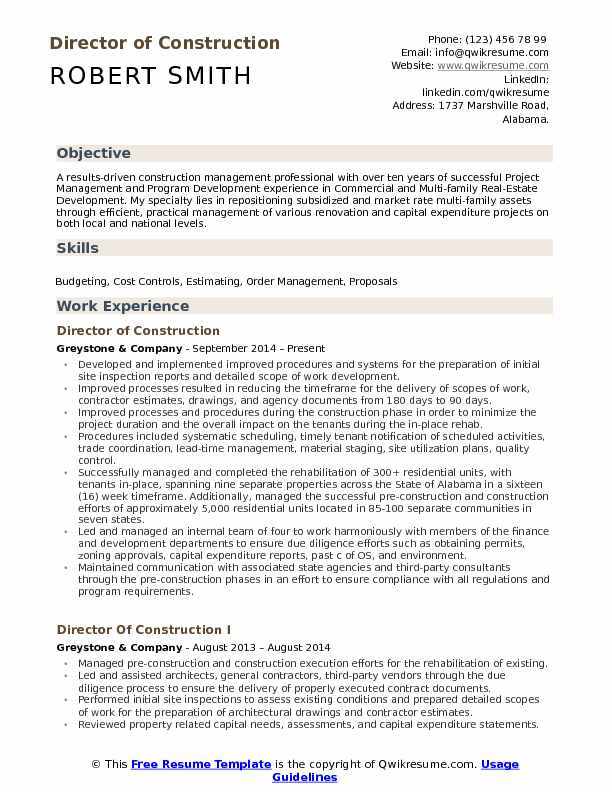 Headline : A results-driven and team-focused Construction Development Director, with extensive experience in site development, Architectural, and Engineering (A&E), and construction management. A proven track record of success in cross-functional team leadership. Works well with multiple teams within an organization to meet deadlines and achieve goals. Utilizes a vast background, knowledge, and professional skill set to contribute to the ongoing success of an organization. 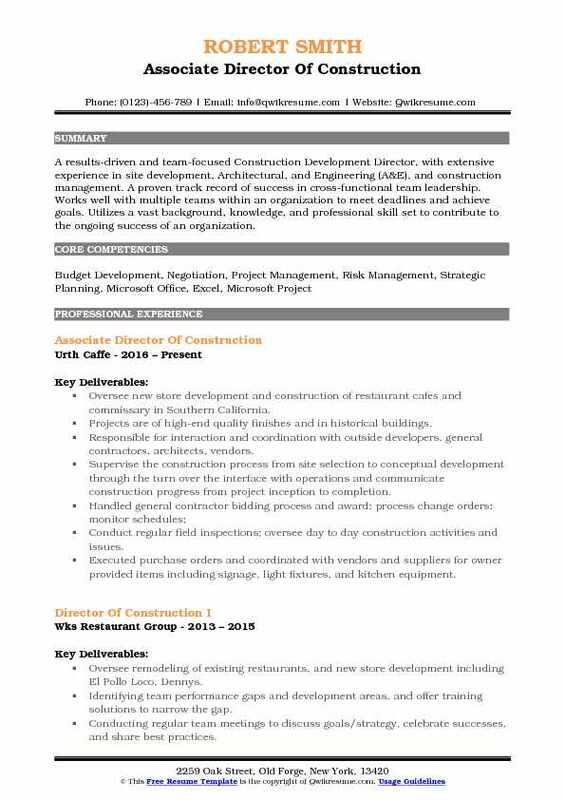 Oversee new store development and construction of restaurant cafes and commissary in Southern California. Projects are of high-end quality finishes and in historical buildings. Responsible for interaction and coordination with outside developers, general contractors, architects, vendors. Supervise the construction process from site selection to conceptual development through the turn over the interface with operations and communicate construction progress from project inception to completion. Conduct regular field inspections; oversee day to day construction activities and issues. Executed purchase orders and coordinated with vendors and suppliers for owner provided items including signage, light fixtures, and kitchen equipment. Approved all invoices and maintained a budget. Meet with planning and zoning to determine use and requirements, applied and testified at city hearings for Cup approvals, and applied for all required permits necessary for the projects. 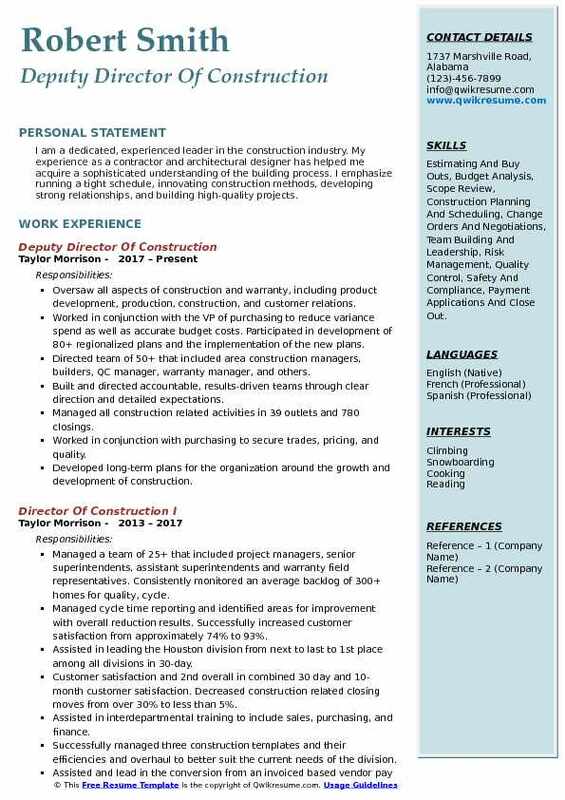 Summary : A dedicated leader with comprehensive construction management experience who has demonstrated the ability to train, manage and motivate team members to achieve organizational objectives and job duties. Extensive experience in project management, team leadership, includes a year-over-year track record of meeting and exceeding expectations. Oversee the overall business development/strategy, estimating, planning, resources, management, and operations on behalf of the company. Responsible for generating new business and fostering existing client relationships to support the company’s growth and profitability in new and existing markets. Identify and develop target opportunities that align with the company’s strategic plan. Review all preconstruction activities including bid schedules and cost estimates for targeted opportunities and/or proposals. Responsible for the managing the bid team, bid strategy, estimating, bidding process, procurement, prequalification of subcontractors, detailed take-off and assisting in project buy-out. Develop and manage all operational support and resources for individual and national projects within the continental and outer continental united states to ensure contract and performance requirements. Responsible for pl of all construction contracts and monitor key performance indicators (KPI) to measure the success of the contract. Advise senior management on the performance of operations, including budget and revenue projections. Assist and interact with internal departments including risk management, legal, quality, safety, etc to ensure requirements are met. Headline : Decisive, action-oriented and results-focused professional, offering 15 years of expertise in hands-on construction development and real estate management. An excellent track record for successful completion of multi-million dollar projects. Achieved this success by developing strategic partnerships, coordinating trades and building constructive relationships with architects, engineers, contractors, clients, attorneys, and community officials. Overseeing construction team on multiple projects between Miami-Dade West Palm Beach, from pre-construction through close-out ensuring budgets were achieved and schedules adhered to. Collaborating with consultants to find ve solutions to maximize project efficiency, cost, and longevity. Creating processes to sure that lessons learned were implemented in subsequent projects. Collaborating with other business unit leaders to ensure that the end product yielded the best return on investment. Creating and/or refining existing processes to achieve as an efficient workflow for each activity within the construction business unit. Providing constructability assistance, by checking for conflicts and deviations, and informing the development/AE team of any conflicts in contract documents and offer recommendations when applicable. Ensuring that the construction contracts were enforced throughout the duration of each project to safeguard the company's best interest. Managing the a/e team to provide timely information needed to facilitate expediency of construction. Overseeing that the construction team provided key items of information required in the processes put in place at pre-mobilization at the closeout of the projects.